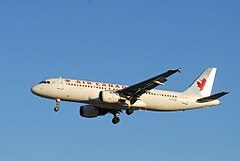 Air Canada Flight 624 was a scheduled Canadian domestic passenger flight from Toronto Pearson International Airport in Ontario to Halifax Stanfield International Airport in Halifax, Nova Scotia. During heavy snow and poor visibility, at 00:43 ADT (03:43 UTC) on March 29, 2015, the Airbus A320-211 landed short of the runway and was severely damaged. Twenty-six people were injured. In April 2015, Air Canada sent payments of CDN$5000 to all passengers involved. A class action lawsuit has been filed in relation to this incident. Air Canada Flight 624 departed from Toronto Pearson International Airport (YYZ) bound for Halifax Stanfield International Airport (YHZ). It was carrying 133 passengers and five crew. The Airbus A320 operating the flight, registration C-FTJP, impacted the ground 225 metres (738 ft) short of the threshold of runway 05 (which is not equipped for precision landing), smashing through an ILS-LOC antenna array. This impact caused the landing gear to separate from the aircraft. The plane also impacted a power line, which cut power to the airport. The aircraft then climbed an embankment up to the runway level, skidded on its belly and stopped 570 metres (1,870 ft) past the threshold. The Halifax airport was without electricity for about 90 minutes. The aircraft was extensively damaged, having lost all landing gear and its port engine. The wings and tailplane were also damaged. Both pilots, twenty-three passengers and a flight attendant were taken to hospital. None of the injuries were life-threatening, and all but one of those taken to hospital were released the same day. The weather at the time of the accident was described as "stormy" (winter conditions). The loss of power to the airport was due to the aircraft clipping transmission lines before hitting the ground. Electricity was restored to the airport by 02:12 ADT. While the aircraft collided with objects outside the airport perimeter and was damaged beyond repair, Air Canada initially described the accident as a "hard landing". The aircraft was an Airbus A320-211 equipped with two CFM56-5A1 engines. Its serial number was 233 with a fleet number of 214, and it first flew in 1991. It was owned by GECAS and leased to Air Canada. As a result of the accident, the aircraft was written off. The accident was investigated by the Transportation Safety Board. The TSB stated that there were no mechanical or maintenance faults uncovered with the aircraft. [not in citation given] Three Bureau d'Enquêtes et d'Analyses pour la Sécurité de l'Aviation Civile (BEA) investigators from France and two technical advisers from Airbus travelled to Canada to participate in the investigation. The final report was released in May 2017, finding Air Canada crew procedures to be the primary cause of the accident. A class action lawsuit was introduced against Air Canada, the Halifax Airport, NAV Canada, Transport Canada, Airbus and the aircraft's pilots which alleges that negligence on the part of the defendants caused the crash, inflicting physical and psychological harm onto the passengers. Other separate lawsuits are being assessed by medical professionals, with settlements based on the relative severity of each client's injuries. On 30 March 2017, Air Canada filed a lawsuit against Airbus, alleging that the manufacturer "failed to identify shortcomings of the Airbus A320", which included uncommanded descent below the pre-programmed glide path. ^ "Air Canada AC624 touched down 335 metres short of runway, TSB says". CBC News. March 29, 2015. ^ "Air Canada Flight AC624: Toronto to Halifax – AC624 Air Canada Flight". Airportia.com. Retrieved March 29, 2015. ^ "Full flight information and flight history for Air Canada aircraft C-FTJP". Flightradar24 AB. Retrieved March 29, 2015. ^ Air Canada Flight 624 passengers receiving $5K cheques from airline; Lawyer Ray Wagner calls it 'a gratuity' and says $5K payments don't change airline's liability, CBC News, April 2, 2015. ^ AC 624 crash: MacGillivray Law to file class action lawsuit; A second lawyer, Ray Wagner, says his firm is considering a class action lawsuit as well, CBC News, March 30, 2015. ^ a b c Simon, Hradecky (March 29, 2015). "Accident: Air Canada A320 at Halifax on Mar 29th 2015, touched down short of runway". The Aviation Herald. Retrieved March 29, 2015. ^ a b "Air Canada AC624 slides off runway in Halifax, 23 sent to hospital". CBC News. March 29, 2015. Retrieved March 29, 2015. ^ "Air Canada Flight 624 crashes into power line upon landing in Halifax". Global News. March 29, 2015. Retrieved March 29, 2015. ^ "Airbus A320 Air Canada plane crashes on runway at Halifax airport". The Independent. March 29, 2015. Retrieved March 29, 2015. ^ "Air Canada Flight 624 crash: ′Hard landing′ too soft a term?". CBC News. March 31, 2015. Retrieved March 31, 2015. ^ Doucette, Keith. "23 treated in hospital after Air Canada plane slides off Halifax runway". Citynews. Archived from the original on March 29, 2015. Retrieved March 29, 2015. ^ a b "AVIATION INVESTIGATION REPORT A15H0002" (PDF). Transport Canada. Retrieved May 19, 2017. ^ "Aviation Investigation A15H0002: Ground contact prior to runway threshold of Air Canada Flight 624 during approach to Halifax Stanfield International Airport". Transportation Safety Board of Canada. Retrieved August 15, 2016. ^ "Flight AC 624, Airbus A320, registered C-FTJP – Halifax Stanfield International Airport (Canada), 29 March 2015" (Archive). Bureau d'Enquêtes et d'Analyses pour la Sécurité de l'Aviation Civile. Retrieved on April 2, 2015. ^ "Air Canada 624 class action certified". NEWS 95.7. December 20, 2016. Retrieved May 11, 2018. ^ "One year after Air Canada crash, passengers say they struggle with PTSD". CBC News. Retrieved May 11, 2018. ^ Thomson, Aly. "Air Canada lawsuit accuses Airbus of negligence in Halifax crash landing". Atlantic. Retrieved March 31, 2017. "What happened on Air Canada Flight 624?". CBC News. March 30, 2015. Transportation Safety Board of Canada: "Collision with terrain involving an Air Canada Airbus A320 at Stanfield International Airport, Halifax, Nova Scotia"
Air Canada: "Air Canada provides Update on AC624"